Invented in the United States in 1981, paintball is a combat-oriented sport where players utilize ‘markers’ that release small quantities of propellant gas which propels a gelatin capsule filled with non-permanent paint. These paintballs break upon impact with the body or equipment of another player if the velocity at impact is high enough. Paintball is a fun sport and it is useful as a training aid to introduce participants to some aspects of combat which cannot be safely simulated using real firearms. Realism between paintball guns and real guns is difficult to maintain with regard to ergonomics, accuracy and range. As a general force-on-force training aid, paintball guns and the proper safety gear can be indispensable. There is a peculiarity in the mind of healthy human beings that makes them hesitant to use force against another human being despite the presence of an obvious threat. Shooting someone with a paintball during a simulated attack scenario can serve as a light introduction to the emotions that may be encountered should that person ever be forced to use deadly force on an attacker. In general, the accuracy of paintball markers is horrible. This is of course speaking of the average. If you were to fire ten shots, no more than 6 would be able to hit a person at 20 yards. Unless you understand this beforehand your confidence in your firearm marksmanship ability will plummet. Various devices have been marketed to purportedly help this situation. From rifled barrels to electrically-operated valves to alternative propellant gases. It does seem that the more expensive paintball guns are more accurate and this jibes from an engineering standpoint—the less variation between parts should result in a more consistent charge of propellant gas. Then you have to consider that the trajectory of a paintball is similar to that of a cell phone thrown out of a car window. A red dot sight on a good gun is reasonable, but this will be useful only for one range as the drop of a paintball is difficult to ‘dope’ for. Though I didn’t have the chance to pace the distance or otherwise properly measure the distance, later experimentation would indicate that I hit a guy at 60 yards distance prior to this photo. That is very uncommon in paintball. What made it especially sweet is that I did it with a gun that cost me $100 new in 2004. It’s a second-generation Tippmann SL-68 pump gun. So passé that I should be ashamed to feature a picture of me with it on my website … from what I’ve heard. Like many other areas, skill has been put in the back seat by volume and ham-fisted stupidity in the realm of paintball technology as well. I like the pump because you have to be ballsy enough to get in close with your target and then hold it together long enough to hit them with a paintball. The odds are that they will be sending volumes of paintballs your way while you are trying to do this. Developing patience and marksmanship ability when you are getting shot at has advantages in other venues as well. Here is how I know that he was at 60 yards. The human eye at 20/20 can see a 1” by 1” object at 100 yards. The paintball, which was white against a dark background, appeared to disappear for a brief moment and then I saw the paint explode on his protective facemask. Since the diameter of a paintball is 0.68 inches, we can assume that the ball disappeared at 68 yards. But I was viewing it through a polycarbonate face shield .. which reduces clarity by 10%. So: 68 yards—6.8 yards = 61.2 yards. Let’s call it 60 yards just to ere on the side of modesty. Figure 1 is a plot, from experimental data using chronographs placed at distance, of a paintball's velocity as a function of range. Most paintball fields in the United States require muzzle velocities of 280 ft/sec. As such, the maximum range of a conventional paintball setup is 185 feet. The velocity at 185 feet will be 80 ft/sec. This is high enough with the tested JT Elite paintballs to break on the polycarbonate face shield that is mandatory protective equipment on paintball fields. Hits to the skin and nylon webbing will require a higher velocity to break the paintball while hits to the metallic marker may allow for a lower impact velocity while still breaking the paintball. This represents the maximum range to which a paintball can function. Hitting the target at this distance is another story entirely. We said earlier that the maximum range of a paintball gun configured for field play is 61.7 yards. This range can be extended to 75 yards if the muzzle velocity is increased to 350 ft/sec. Two hazards exist with this course of action—a player who is hit before the paintball has slowed down to 280 ft/sec or lower will receive a painful and perhaps physically-damaging wound. The other problem is that the accuracy of the paintball is either badly decreased or enhanced. There seems to be a threshold around 300 ft/sec where a paintball will either veer violently after it exits the muzzle or will travel with greater accuracy. 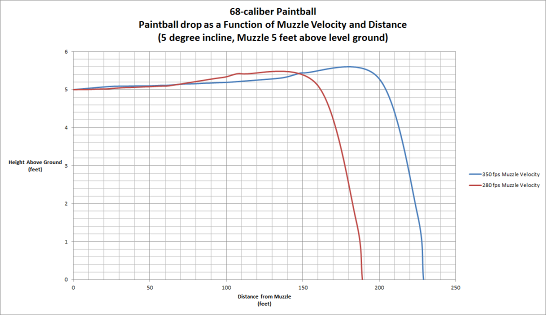 When the paintball travels straight, the accuracy of the shot is increased because the time in flight is decreased. This reduces the bullet drop and also any forces pushing the paintball to the side will have less time to work to push the paintball off course. The variability in results is due to the deformation of the paintball caused during launch. Paintballs are gelatin capsules which can be considered to be solid-fluids. Under pressure, they will deform slightly. Using a conventional paintball gun, the gelatin is distorted during launch if the paintball doesn’t break inside of the barrel. Gelatin is also a spring. This means that the paintball will elongate slightly in the, say, horizontal plane, which makes it shrink in the vertical plane. This creates a transient change in the air pressure acting along the surface of the paintball. Technical solutions to this problem exist but it does not appear that they are being pursued in the paintball industry today. 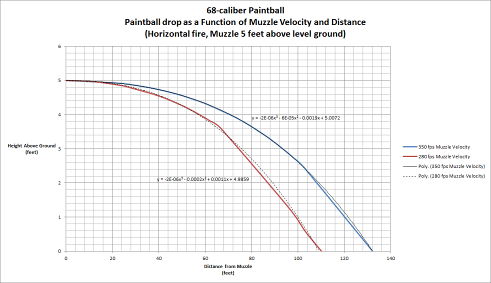 Figure 2 is a plot of how much drop to expect if you point a paintball marker completely horizontal and fire a paintball at 280 ft/sec and 350 ft/sec. This is experimentally-obtained data using chronographs placed at the muzzle and at the distance indicated. The assumption is that the marker is situated 5 feet above the ground—shoulder height for an adult male. It is immediately apparent that the paintballs will hit the ground while they still have enough velocity to break on an opponent. This necessitates firing with the muzzle slightly elevated to increase the distance. But … what is the optimum angle of inclination to maximize range and probability of tagging out an opponent…? 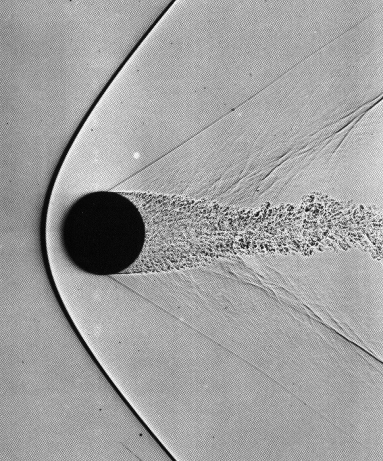 What happens when the angle of the marker barrel is changed to positive five degrees with respect to the horizontal is shown at right. The range of the 280 ft/sec paintball is increased 73-percent while the 350 ft/sec paintball is increased 74-percent. 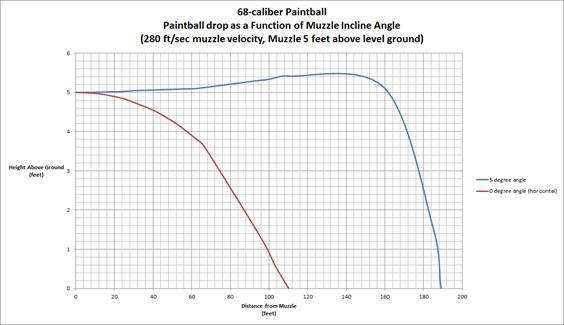 Apparent on the graph is an apparent ability of the paintball to ‘ramp up’ its altitude above the ground. As confirmed by high speed videography (below) there is no ‘backspin’ imparted to the paintball as it leaves the muzzle. 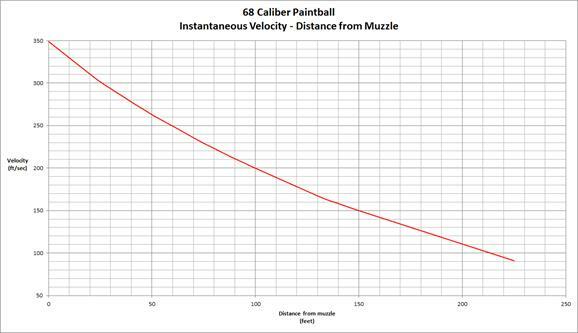 What actually happens is that the horizontal velocity of the paintball is much higher than the vertical velocity, when shot at a 5 degree incline. The faster an object moves, the faster its slows down due to aerodynamic drag. The horizontal component at the muzzle is 279 ft/sec while the vertical component is 24 ft/sec. As such, the ball is still ‘climbing’ while the sideways motion slows, giving more vertical travel and less horizontal travel. We can easily see the range increase as the barrel is elevated to 5 degrees above horizontal. The optimum angle for a paintball marker was calculated to be 7 degrees above horizontal if you are looking to maximize range and still have the paintball moving quickly enough to break on the target. Below, I invite you to browse through some additional slow motion videos that we have of paintballs traveling through air and impacting different target types.